Piriformis syndrome is due to tightness in the piriformis muscle which leads to sciatica, or shooting nerve pain down the back of the leg. The root cause of the problem is often a misalignment in the low back/pelvis which leads to chronic spasm in the piriformis muscle. The sciatic nerve runs very near this muscle and in some people it runs directly through this muscle; therefore, when the piriformis muscle goes into spasm, it irritates the sciatic nerve leading to sciatic nerve pain. If you find that the pain improves with stretching, but keeps on returning, you may need specific chiropractic adjustments in the low back/pelvis/hips. By getting specific adjustments, this will allow the piriformis muscle to relax so that your pain relief lasts. We see this case several times a week in which the patient comes in with severe pain in the glute region. It often responds very quickly with treatment, as patient’s typically feel better in 2-3 visits. Treatment often consists of adjustments along with soft tissue work such as PIR stretching of the piriformis muscle and other surrounding muscles. Stretching of the piriformis muscle is probably the best thing you can do at home to help relieve some of the pain. You can also apply heat to the glute region where the achy pain occurs. Heat helps relax any muscle spasm that might be causing pain. If heat doesn’t work, you can attempt ice to the area of pain as the ice will help calm down any sciatic nerve pain. Exercising and avoiding prolonged sitting is the final recommendation in dealing with piriformis syndrome. Stretch 1: With the first stretch, you’ll do it seated as pictured on the far left. Lean forward and put pressure on the knee until you feel a stretch in the glute region. Hold this stretch for about 10-15 seconds and do this 2-3 times. None of these stretches should be painful, but mild discomfort is normal with the stretching. If painful, you are most likely overdoing the stretch. 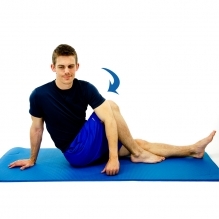 Stretch 2: While on your back, pull your knee over and across your body until you feel a stretch in the glute region. Hold this stretch for about 10-15 seconds and do this 2-3 times. Stretch 3: While on the floor, and as pictured in the far right, you can cross one leg over the other and use your elbow by pressing it up against the bent leg until you create a stretch in the glute region. Hold the same as the first two stretches. All three of these stretches are great for piriformis syndrome; however, they are also effective for general low back pain. It is important to stretch daily and if you incorporate regular chiropractic care, you’ll be on your way to less pain and improved function in your daily life. *Always consult with your physician before beginning any exercise program or home treatment.